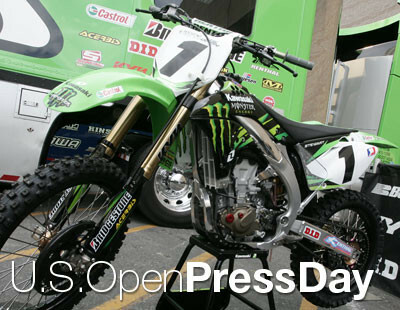 Click the following link for a quick photo gallery from press day at the Rockstar Energy U.S. Open. Want a wallpaper of James Stewart's Monster Energy Kawasaki KX450F? Click the dimensions (1400 x 1050 or 1440 x 900) to open the large image in the aspect ratio that work best for your monitor. After the window pops up with the large image, you can right click to save it as your desktop image (PC), or Control-click to set it as your desktop (Mac). Here's a quick peek from Thursday, Press Day, at the Rockstar Energy U.S. Open. Chad Reed (San Manuel Band of Mission Indians Yamaha) and Timmy Ferry (Monster Energy Kawasaki) met with the local press, and did a few laps on the track for cameras. While James Stewart wasn't around for today's festivities, it was cool seeing his bike being readied for tomorrow's action, and sporting the number one plate after wrapping up the '07 Supercross title. We love seeing champions running the number one plates that they've earned. Be sure to check back throughout the weekend for more updates from Las Vegas.